A list of film's most important visionaries were assembled, collecting only the names of those whose work and techniques had been felt by millions of moviegoers. 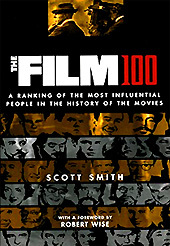 The list celebrated individuals who produced effects that directly or indirectly created changes in the way films were made, seen, distributed, and preserved. The list traced back the ripples of influence to their originators, and gave credit where credit was due. Just about every inventor and scientist connected to the film industry was originally on the list, but most were edged out by businessmen who exploited their invention. Notoriety or fame played no part in the selection. Joint contributions were treated as a single entry, and large governing bodies like the Screen Actors Guild were not eligible. Innovations that have been credited to an anonymous person were not considered. The list had to be whittled down to one hundred names which meant a long and difficult elimination process, before assigning the final ranked positions. Consequently, many popular persons were not included in this compilation. Following each entry are some selected or recommended films that illustrated each person's influence and innovations. films that "The Greatest Films" site has also selected as the "100 Greatest Films"
Actor, Director, Producer, Screenwriter, Composer; "The Little Tramp"
Watch for the scene in the cafeteria, where Chaplin juggles three emotional plates; the love interest, the suspicious waiter, and a growling stomach. The elegant resolution of the scene shows thoughtful and painstaking story development that few directors have taken the time to work out. To his sight gags, Chaplin adds camera tricks in this Yukon story; notably in the transformation of Chaplin into a chicken. The dream sequences of the Tramp show that pathos was not simply a byproduct of Charlie's subtle acting, it was deliberately built up through story points. The highest art of the lowly Tramp. This perfectly structured film puts Chaplin through the wringer, as he tries to collect enough money to restore the sight of a blind flower girl. The curbside gags are a model of economical editing. And the final scene is pure magic. Silent Screen's Greatest "Star" Actress, "America's Sweetheart"
Blink and you're bound to miss an innovation. Chock full of film firsts, this is the measuring stick of great films. Notice the absence of titles at the beginning. Listen for music that stops dead on a character's main line. Look at the details--because you can; deep focus lets you view scenes, like Susan's suicide attempt, from front to back rather than side to side. Probably not the finished vision Welles hoped for. But there are still touches of visual beauty, fancy camerawork, and crisp dialogue in every scene. Much like KANE, this film benefits from the ensemble that Welles would never gather again. Considering Welles was handed a bad script, a shoestring budget, and 42 days to shoot, this is a masterstroke. Dennis Weaver puts in a surprisingly strange part, and the dingy locations upstage the actors. Don't just look at it, listen. Radio stations, intercoms, and buzzing neon lights are cleverly used to enhance the mood. Movies that ran nearly three hours were unheard of in silent days, and since Griffith was a safe shooter, tons of film was reeled into the making of BIRTH. Griffith kept the project a close secret, working only with Bitzer on most of the film. So see it with the notion that the cameraman had great influence over many of its scenes. The famous spectacle gets most of its attention from the huge sets. But someone had to capture them. Master of the long shot, Bitzer often strapped the camera to the front of a car and rode along straddled over the hood through the gargantuan Babylon. Not her finest film, but to get a sense of Garbo's incredibly magnetic allure, it can't be topped. Despite walking around in pants, her femininity doesn't wane. The final shot of her staring into the sea is one of film's most enduring images. Leave it to director Ernst Lubitsch to strip away the old Garbo and create a sophisticated yet fussy performance that exposed her gifts for comic timing and delivery. By the 20s, Chaney pictures were made on his terms and he had script approval power. That's probably why HUNCHBACK is stripped of its politics and left with the relationships. This fundamental example of maid and monster is the origin for all other imitations, including Chaney's own later films. Another Beast and Beauty story, but examine the stiff, slow movements of the title character that would later become standard horror characteristics of Lugosi's Dracula and Karloff's Frankenstein.